The majority of Americans — 6 in 10 —want Congress and President Trump to make lowering prescription drug prices a priority. This isn’t just a political issue, but a very personal one. We are all moved by stories of women struggling to pay for prescription drugs, such as 57-year-old Saundra Johnson who earns less than $20,000 a year and, although she receives some public assistance, cannot afford the dozen prescriptions for her health issues of congestive heart failure, diabetes, and other related health concerns. Like one out of four people in her age range, Johnson takes less medication than prescribed because of the cost. Johnson represents so many mothers, sisters, aunts, and cousins in the black community who struggle to afford the medicines that keep them alive and healthy. However, there is a lack of knowledge about what drives prescription drug costs. To find a solution to any problem, you first need to understand the causes. The price of prescription drugs starts out high because the process to get them to the market is astronomically costly and lengthy. On average it costs $2.87 billion to bring a new drug to market according to a survey of 106 randomly selected drugs. Basic research, discovery, pre-clinical trials, clinical trials, approval by regulatory bodies, manufacturing, and distribution take about 10 years from start to finish. Prices on new drugs are set extremely high to recover investment costs for all of these phases of development and to subsidize costs for drugs that never see the light day. An eye-opening number of drugs researched never make it to the market. Like other entrepreneurial ventures, investing in developing life-saving drugs and cures is risky. Investors will take the risk when the reward is big. In a market that works correctly, the price of a prescription drug is driven down by new competition. However, the prescription drug market is not truly competitive. Factors including intellectual property protections, middlemen, and foreign imports keep prices high. New drugs enjoy 20 years of patent protection starting when human clinical trials begin. Patent protections are important to attract investment and recoup investments in drug development. New drugs also benefit from marketing exclusivity. But these legal protections limit market competition keeping drug prices high. Once generic options enter the market, branded drug prices fall, which is a big benefit to consumers. 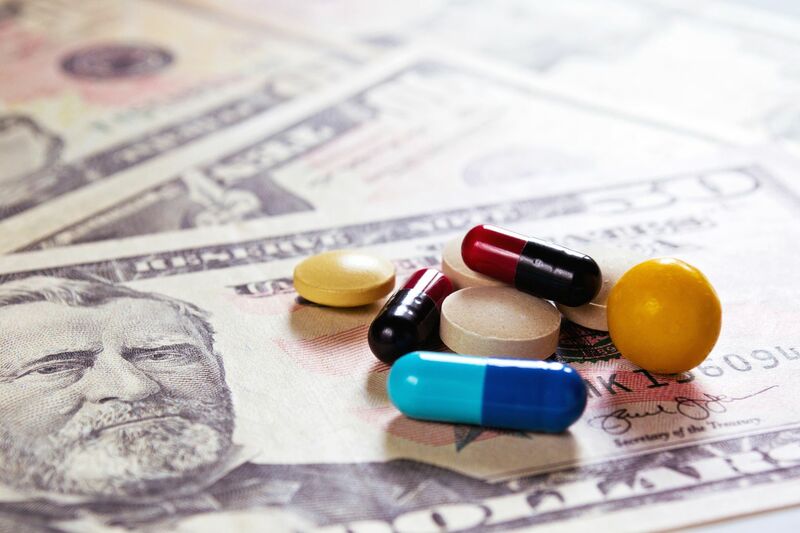 According to FDA research on prescription drugs sold from 1999 through 2004, the first generic competitor only lowered the price on the brand-name drug marginally, but the second generic option cut the brand-name drug price by nearly half. By the ninth generic competitor, the average generic price fell 80 percent or more. Once drugs are on the market, the supply chain and payment system become factors in price. The payment system for healthcare is complex and opaque. Intermediaries called Pharmacy Benefit Managers (PBMs) manage prescription drug plans for more than 266 million Americans with health insurance from private health plans and public plans including for federal and state government employees, Medicare Part D, and Medicaid. PBMs should negotiate rebates from drug manufacturers and discounts from drugstores, encourage the use of generic drugs and more affordable brand options, and manage the use of high-cost specialty medications. However, Congress and the adminstration are concerned that healthcare plans and PBMs are not passing on negotiated rebates and savings to customers, which should lower drug prices. Patients rarely understand what goes into their bill and aren't always able to make informed decisions. Other countries attempt to control drug prices by setting prices low. They also may refuse to pay for drugs that don't have sufficient medical benefits to justify the costs. This heavy-handed approach distorts the prescription drug market leading to shortages. It also stifles competition because it removes the financial incentive for drug companies to produce drugs that are in high demand or to invest in developing new treatments that are costly and may never make it to the market. As we seek policies to help make drugs more affordable for people like Ms. Johnson, we must recognize that the factors contributing to high drug prices are almost all rooted in a lack of competition. Any solutions that don't address distortions and disincentives to competition may be well-intentioned but will fall short. At risk may be the development and availability of life-saving cures and life-enhancing treatments.